Devon is the third largest rural county in England and one of the most sparsely populated. ‘Coastal and countryside’ is the dominant ONS cluster in the county. Devon is not commonly perceived as a deprived area, but a further analysis reveals relatively high levels of rural deprivation in the county. 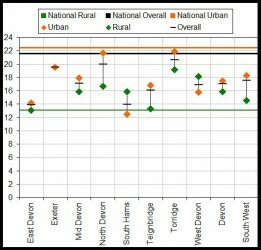 Figure 4 presents overall, urban and rural deprivation scores for the 2010 Index of Multiple Deprivation. 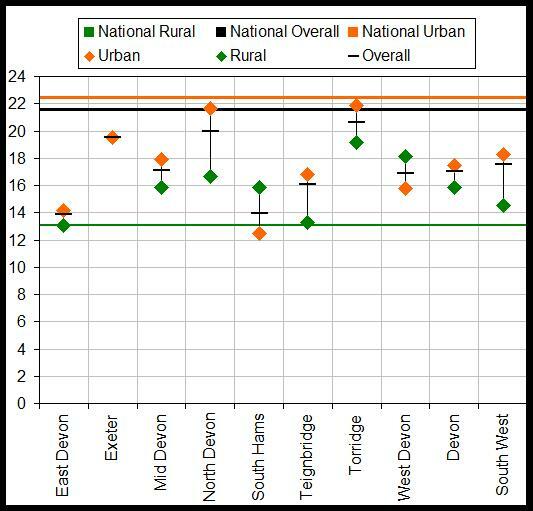 This reveals that Devon has higher levels of rural deprivation than the national average and lower levels of urban deprivation. Issues include social isolation, a low wage economy, high housing and living costs and greater distance from services. Areas of Torridge and West Devon are most severely affected.